Skyblade’s Claim – coming June 27! Take to the skies again! Skyblade’s Claim, the second novella in the Skyblade Saga, is coming to Amazon.com June 27! 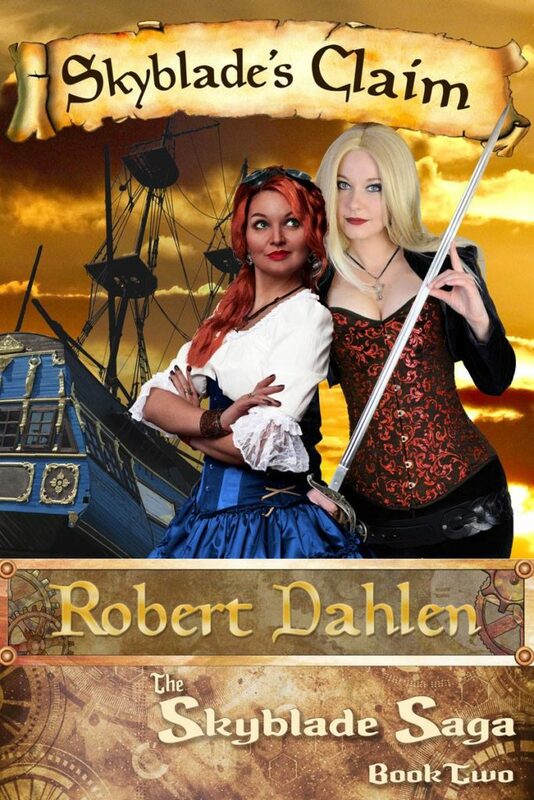 Annabel Skyblade, notorious pirate captain, has a mystery on her hands: an enchanted piece of parchment she acquired while raiding a Svendaran airship. Victorie Brassfield, the Cerindel Navy’s top intelligence officer, found another one just like it in the pocket of a Svendaran agent. Annabel and Victorie have a history. After coming together over a common goal, their unlikely friendship blossomed into a budding romance. But it’s been hard to maintain a relationship when their hearts take them in different directions – and put them on opposite sides. Now they share a common quest once more. Can Annabel and Victorie uncover the mystery before them, through wild beer festivals, stately balls, and far-off-tropical islands, without letting their passion get in the way? Will this bring them closer together…or lead them to their bloody doom? First off: If you’ve never read Skyblade’s Gambit, you can find it here at Amazon.com. Due to restrictions on Kindle Worlds books, you can only buy the Skyblade Saga at Amazon’s US website. If you live outside the US, you should still be able to get a copy, but if you can’t, contact me and we can work something out. Skyblade’s Gambit and Skyblade’s Claim are part of the Plundered Chronicles, a Kindle Worlds setting based on the pirate novels of Alex Westmore. If you’re not familiar with Kindle Worlds, it’s a program from Amazon that allows authors to write stories set in various established fictional universes. Some that you might recognize are G.I. Joe, Veronica Mars, The 100, the Valiant Comics universe, and…the world of Kurt Vonnegut. Seriously. Adventure, fantasy, laughs, romance, and pirate action – you’ll find all that in Skyblade’s Claim! Take to the skies!